Illinois Horse Fair is proud to offer Youth Judging for IHF2019!! 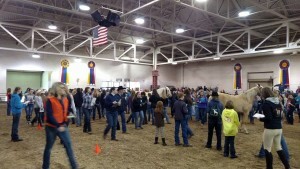 After a successful return, Youth Judging is back at Illinois Horse Fair. We are looking forward to seeing many fine individuals and teams put their equine knowledge to the test on Saturday March 2nd. Thank you to our sponsors, Illinois Equine Promotion Board, Kendall County Horse Show Association, and Rock River Trail & Horseman Association!